Always considering the needs of families, Hale-Sarver opened The Hale House, an elegant three bedroom, with lounge, two-bath, bed and breakfast that comfortably sleeps six. Situated adjacent to the funeral home, it offers convenient, overnight accommodations to family members from out of town. A home away from home, The Hale House, completed in the fall of 2000, was built to give families of Hale-Sarver Family Funeral Home a convenient, reliable place to stay. It’s a difficult enough time, without having to search for a comfortable, close-by place to rest. 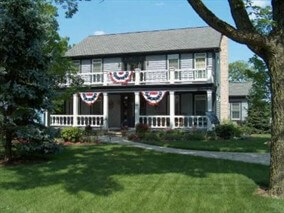 This home offers a very nostalgic, historical feel, reminiscent of the original Hale-Sarver home.